Having the right travel accessories can make all the difference, whether it’s a short business trip or a two-week vacation. 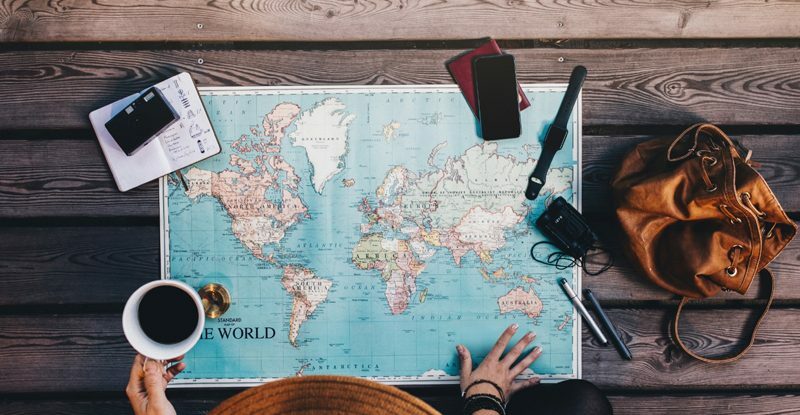 From trendy RFID wallets and packing cubes to mobile hotspots and comfortable travel pillows, there’s a travel accessory for everyone on this list. Here are Amazon’s best-selling travel accessories. The GDTK leather passport holder is made to hold your passport, credit cards,business cards and boarding pass. This practical travel accessory features a lightweight and flexible design, as well as built-in RFID blocking to prevent personal information disclosure during travel. It’s also available in a variety of bright and fun colors. Sleep well during your journey so you can arrive at your destination feeling great. There are several styles of travel pillows that support your head and neck, providing the ultimate comfort while sleeping in an upright position. The Trtl pillow is an Amazon bestseller and it’s ergonomic shape and compact design have made it popular among frequent fliers and road warriors. Never worry about losing power again with a travel USB charger. The best-selling travel charger on Amazon is the iClever Boost Cube with 4.5 stars and more than 12,000 reviews. It features two USB ports with 24W/4.8A power and it allows you to charge two devices at the same time. This charger also has Smart ID technology and recognizes any device. The portable and lightweight charger is compact enough for traveling and is compatible with most smartphones and tablets. Fitting perfectly in your travel backpack, these set of four packing cubes provide the ultimate organization for your suitcase. Keep your clothes wrinkle-free by neatly packing them in these space-saving bags. You can also keep your clean and dirty clothes separate while traveling. These 4-inch-deep bags are made of durable, water-resistant nylon and come with a separate laundry bag. Skip surprises at airport check-in and know the accurate weight of your bag with a digital luggage scale. The Etekcity Digital Hanging Luggage Scale is the No. 1 best seller on Amazon. It offers high-accuracy readings for hefty weights and its design makes it portable and easy to store. Now you don’t have to worry about packing that extra pair of shoes or souvenir for mom. The Zoppen RFID-blocking travel wallet features a tri-fold design to help protect and organize your important items while traveling. This particular wallet has one passport pouch, three card slots, one ID pouch, two ticket compartments, one zip pocket, one sim card slot and a pen holder. It also can hold U.S. money and has a spot for a smartphone. Highwind Cruise Luggage Tags includes four clear luggage tags and two ID badge holders with black lanyards. They can be used for several cruise lines including Princess, Carnival, Holland America and Norwegian. The tags have zip top seals to protect your tags from getting wet or falling out, and come with stainless steel rings to ensure tags won’t fall off. Keep your shoes separate from your clothes with travel shoe bags. The YAMIU Travel Shoe Bags come in a set of four waterproof nylon bags with durable zippers. It’s an Amazon’s Choice and the No.1 best seller in shoe bags, with a more than 95 percent 4-star and 5-star reviews. One of the best electronic travel accessories, you can lose yourself in the music or block out loud noises with a great pair of headphones. Bose QuietComfort 35 are wireless noise canceling headphones that are topped rated on Amazon and have 20 hours of battery life. They also feature a dual-microphone system that allows clear calls and voice access to your smartphone. Keep your valuables safe with Forge TSA-approved cable luggage locks. The zinc alloy body of the lock is strong enough to survive tough baggage handling. The durable cable is also thin enough to fit through standard luggage zippers. The locks feature an easy-to-set, three-digit combination that can be reset as many times as needed. Perfect for frequent fliers and minimalist travelers, the Zero Grid Neck Wallet is easy to conceal while protecting your important travel necessities. This slim wallet can fit under a T-short, button-up shirt or blouse, and protects against RFID scanning and common pickpocketing. The adjustable elastic strap makes it comfortable to wear, not to mention keeps you hands free while traveling or sightseeing. The Pantheon toiletry bag is lightweight and durable, and its interior is lined in case of accidental spills. The wide-open design allows adequate room for all your necessities. The main compartment can hold larger toiletries like shaving cream or shampoo bottles, while a zipper mesh pouch can fit cosmetics or smaller essentials. The bag measures 9.25 x 4.72 x 4.72 inches, and includes a built-in hook and side handle. Rest easy while traveling with a portable footrest. The Ohderri portable footrest is a lightweight carry-on footrest that makes sitting during a long flight more comfortable and less cramped. A portable footrest can also be used on trains or in the office. The Travelon travel bungee allows you to move two bags as one so you can carry more with less effort. The bungee attaches to the handle of your wheeled luggage, working on both single- and double-poled handle systems. You can securely attach a second bag to the handle and move with ease through the airport. Keep your personal belongings safe while staying hands free with an RFID money belt. The Alpha Keeper belt is made with three layers of RFID-blocking material and water resistant nylon. The sleek and lightweight travel pouch comes in a variety of colors. It keeps your hands free and features an adjustable strap for different waist sizes. With leak-proof travel bottles, you don’t have to worry about your shampoo soaking your clothes while traveling. Kitdine silicone bottles come in a set of three and are TSA carry-on approved. These BPA-free silicone bottles are designed with a three-layer anti-leakage cap and wide mouth for easy refilling of shampoos and lotions. Kitdine travel bottle sets are available in 2oz, 3oz and 3.3 ounces and a variety of colors. An easy way to identify your luggage at baggage claim or if lost, luggage tags are a must-have accessory for traveling. This particular set from TravelMore comes with 14 flexible bag tags made of PVC silicone material that can be bent without getting damaged. The tags come in several neon colors to help you spot your suitcase from far away. You can travel anywhere and have access to the Internet with a mobile WiFi hotspot. The GlocalMe U2 4G Mobile Hotspot is a best seller on Amazon with 288 customer reviews and 4.5 stars. It uses Cloud SIM technology and users have coverage in more than 100 countries and regions. Users can connect up to 5 WiFi-enabled devices at a time using 4G LTE high-speed Internet. This device has an app where users can buy and manage data, and it also features two SIM card slots. Whether you travel like a minimalist or just need a great carry-on bag, a travel backpack can take you a long way. The Outlander Travel Backpack is a great example, as it provides ample storage with several pockets and only weighs 0.5 pounds, so it’s compact enough to fit in your suitcase or purse when it’s not in use. This TSA approved toiletry bag by Cableinthebay is an essential when passing through airport security. It’s a 1-quart bag is a no-hassle way to pass through security with your carry-on liquids and it’s compliant with TSA 3-1-1 regulations.The waterproof, transparent bag measures 7.2 x 5.5 x 2.5 inches and holds small toiletries, cosmetics, and travel-sized bottles. Keep your suitcase securely closed or attach two bags together for smoother transit in an airport with a sturdy luggage strap. The BlueCosto luggage strap is a heavy duty buckle and strap that comes in a variety of bright colors to help you differentiate your bag from others. The adjustable belt will fit suitcases between 20-32 inches. Stay stylish while also keeping our money and valuables secure with a travel scarf. The pocket allows you to store credit cards, money, passport and other necessities while you’re on the go, and it keeps you hands free when exploring your destination. These scarves come in a variety of colors and patterns, so you’re sure to find one for every outfit. The BESTEK Universal Travel Adapter is a best seller on Amazon with more than 2,700 reviews and four stars. It converts all countries’ voltage to US voltage so you can safely charge devices and use electronics when traveling internationally. This version allows you to charge up to seven devices at the same time while its design keeps it compact for traveling. Perfect for on-the-go washes, a 3-1-1 TSA compliant travel pack of laundry detergent is helpful when you’re on the road. Whether you pack light or need to remove a stain, keeping a travel-size laundry detergent in your bag can come in handy. Whether you need to keep your shoes shiny or touch up a scuff mark, you can always look your best with a travel shoe cleaning kit. Jason Markk’s premium shoe cleaner comes in travel size and is a popular seller on Amazon. The kit includes a 2oz. premium shoe cleaner, a mini premium brush, a 9” x 9” microfiber towel and three quick wipes.